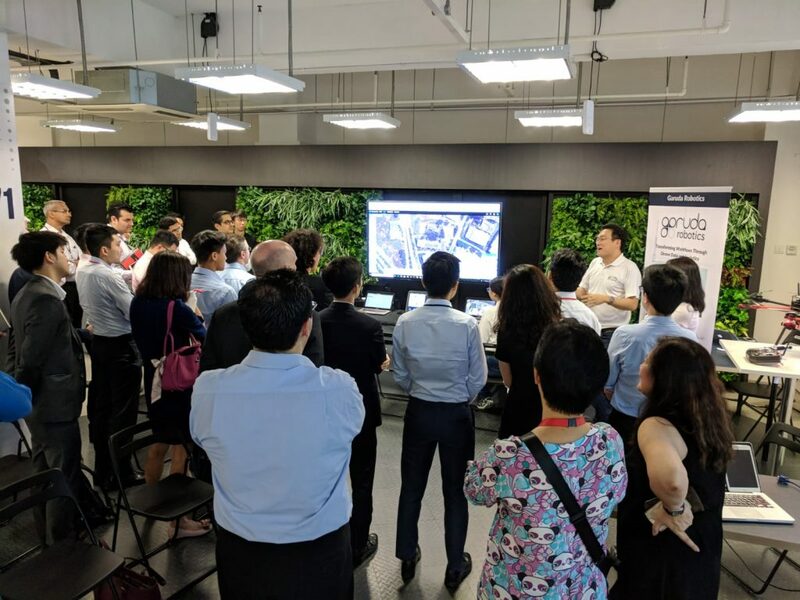 On 14 June 2018, we were invited by Singtel Innov8 to give a sneak peak of our upcoming product, the Drone Operations Center, to a group of institutional investors, at the newly refurbished ICE71 offices in Block 71. Although our original plans for a live flying demo were cancelled partly due to the Trump-Kim summit, the investors nevertheless got the full glimpse of the future, by being at the front seat of an operational Drone Operations Center (DOC). The DOC is a step increase in capability for Garuda Robotics, as we try to achieve beyond-visual-line-of-sight BVLOS flight in the dense urban environment of Singapore. It can be used to operate a security patrol fleet, a logistics delivery fleet, or an infrastructure inspection fleet. At its core, the DOC consists of several cloud hosted command and control services, connected to drones via reliable and secure 4G LTE mobile network. 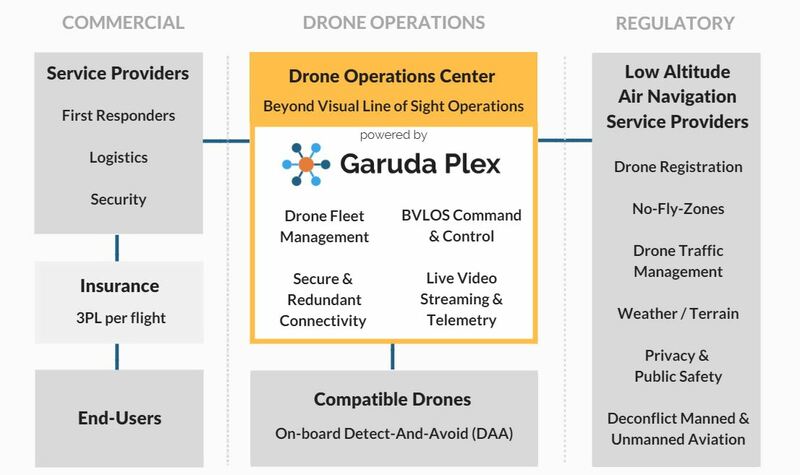 It is tightly coupled with drone air navigation service providers (UTM) for airspace restrictions and meteorological data, Garuda SkyStream for video live streaming, and Garuda Plex for enterprise drone fleet management. The DOC provides BVLOS pilots with high levels of situational awareness of the drone, but limits the pilot’s authority to command the drone to pre-assessed and pre-approved flight paths, including paths to multiple emergency landing and recovery areas. Its open architecture allows for both enterprises and drone manufacturers to easily plugin their ordering or scheduling software and custom drone platforms respectively. Singtel has been very supportive of our endeavour from the start. Recognising that today’s consumer mobile internet is a far cry from the quality of network service (QoS) required for mission critical autonomous robots of the future, Singtel has been working closely to test and profile both their network performance in the sky, as well as understanding specific use cases for the drone economy to better plan a suitable QoS, cyber security defences, and even make infrastructure adjustments to ensure sustained low latency connectivity between the Drone Operations Center and the drone. The DOC is currently still in Alpha and available to select customers only. On the roadmap, we also plan to go beyond Singapore to build a regional edition that can better handle a large area mapping fleet and an agriculture sprayer fleet. We would like to thank Singtel innov8 for the showcase opportunity once again.